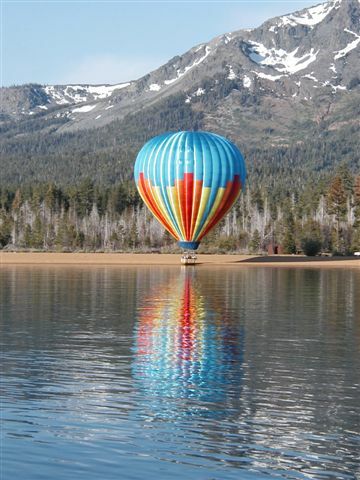 Lake Tahoe Hot Air Balloons, Inc. - Spectacular opportunity to own the most unique Hot Air Balloon business in the world. A turnkey operation that is very well established with a proven record. Flights over beautiful Lake Tahoe originating from the "Worlds' Only" United States Coast Guard inspected and certified 110' launch and recovery vessel named the "Tahoe Flyer". Operating since 1996, this is a very successful summer business. Year round potential exists with land based flying during the winter months in the nearby Carson Valley. Business is in a very non-competitive market and carries an outstanding reputation within the community also earning the "Certificate of Excellence" from Trip Advisor for several years. For additional information and photos please click the link above. You can also review our web site from there. If you are interested or have additional questions please contact Harley Hoy @ 530-308-8590 or via email at Harleyhoy@gmail.com. Coastal Maine Balloon Ride Business - Opportunity to take over an established flight service with a successful 20 year track record in beautiful coastal Maine. Good flying area with dramatic views and strong tourism industry.